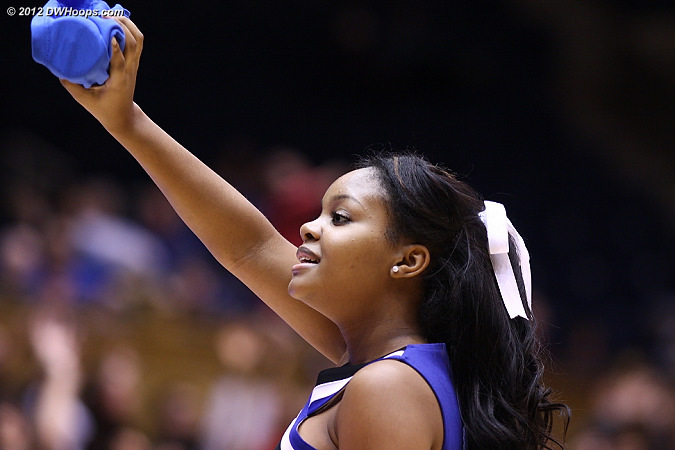 200+ raw photos are available for our DWHoops members to view. 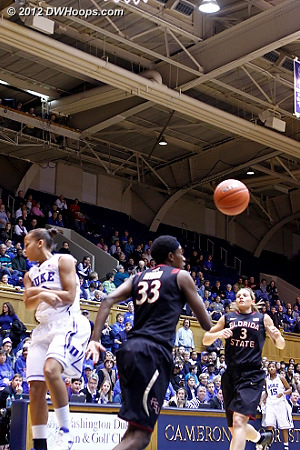 The general public can see photos through most of the second half as well as all top photos. 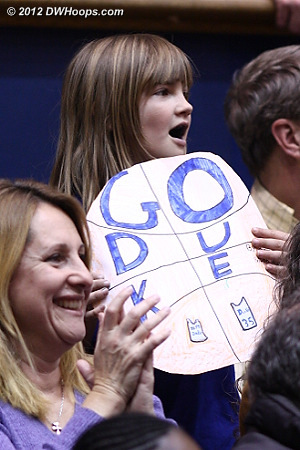 As always, we are grateful for the support of our members! 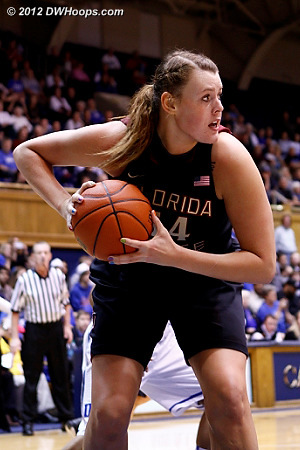 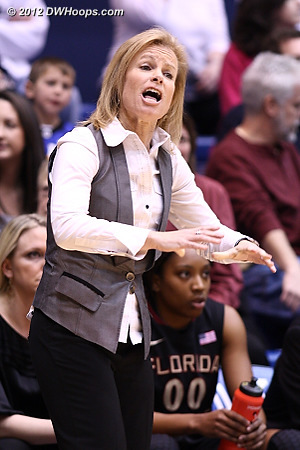 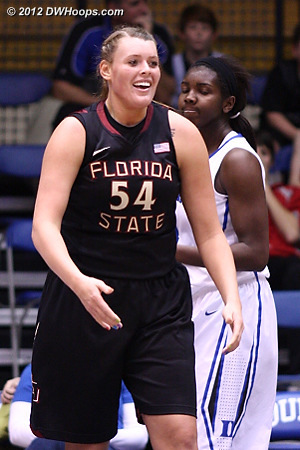 Tricia Liston hits a two point jumper, but FSU still leads 6-5. 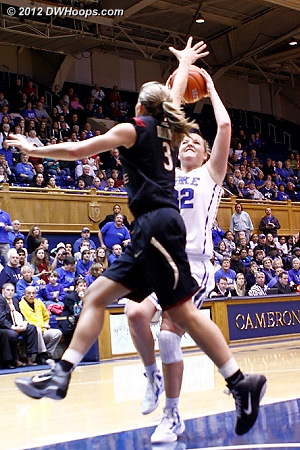 Alli stuck back her miss, 10-8 Duke. 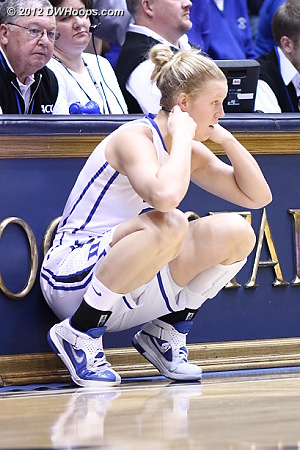 Bravard seemingly unchallenged, but she'd cleared out for her second foul, and would spend the remainder of the first half on the bench. 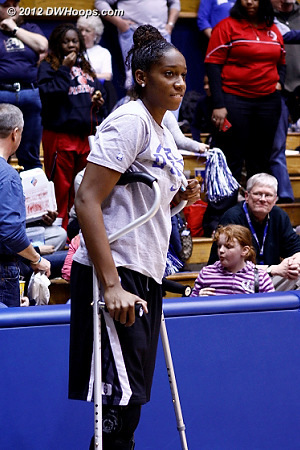 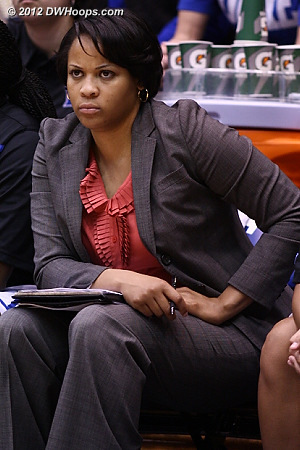 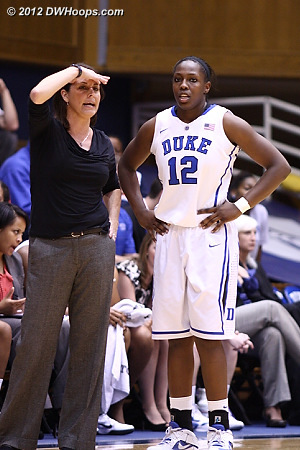 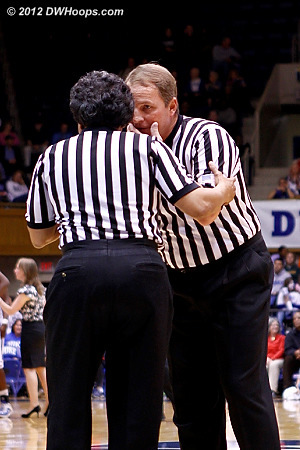 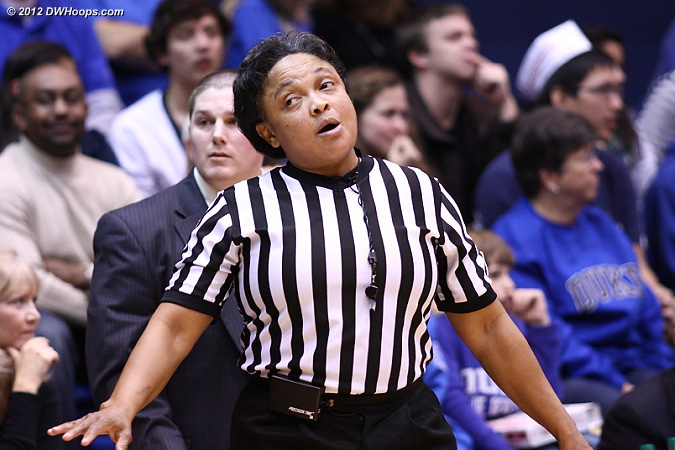 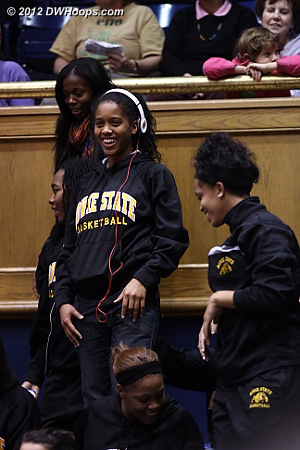 Bonita Spence responds to Sue Semrau after Bravard's quick second foul. 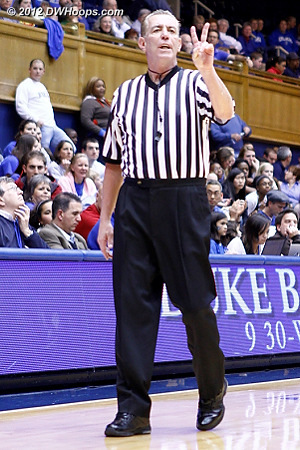 Coach P wants hands up on defense. 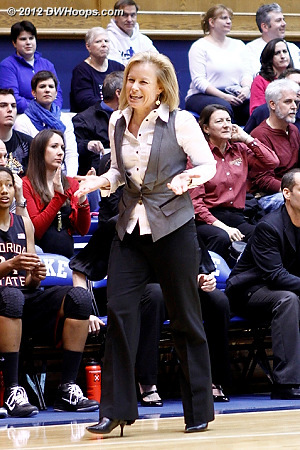 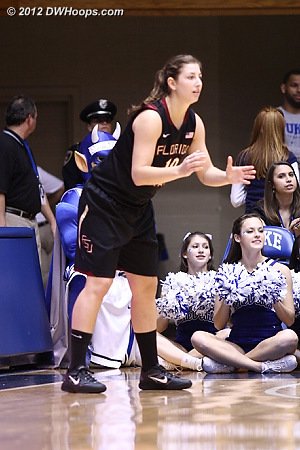 It didn't work, as FSU got an open three point look shortly thereafter. 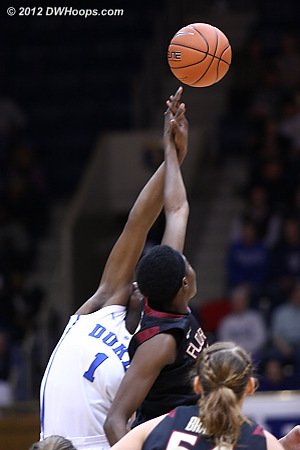 No credit for a shot block. 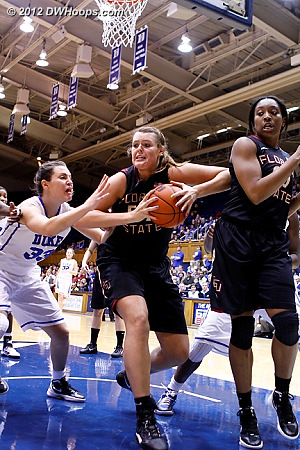 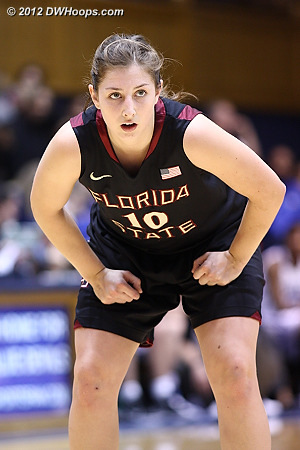 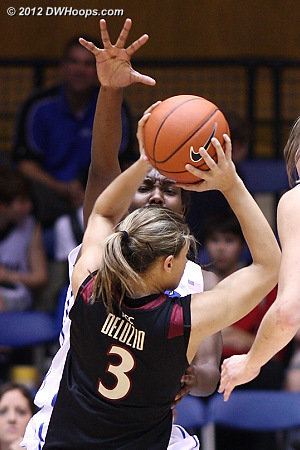 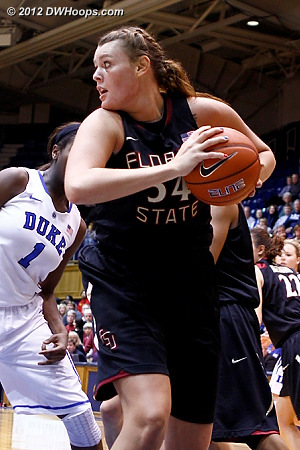 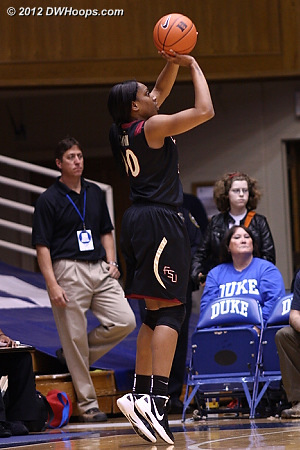 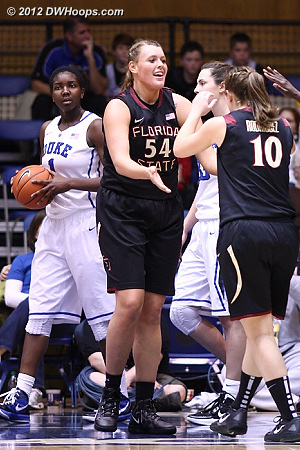 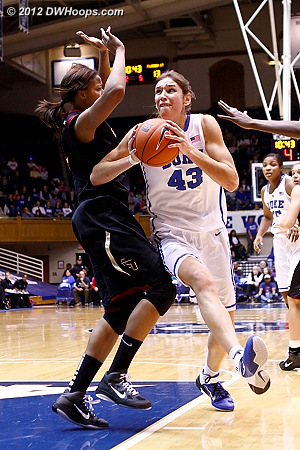 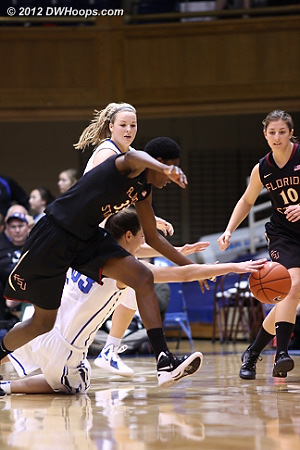 FSU's Leonor Rodriguez played 31 minutes, fourth most among the Seminole starters. 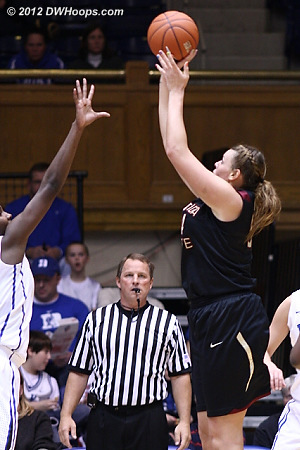 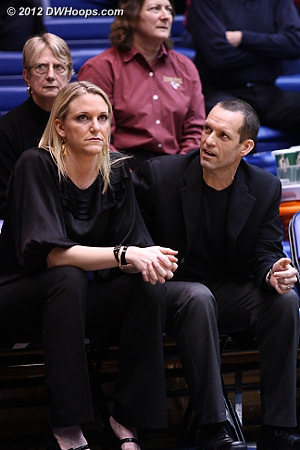 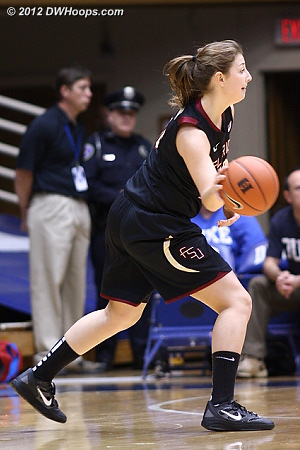 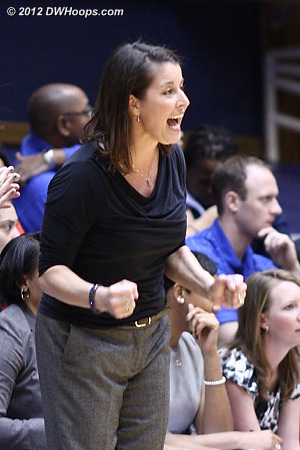 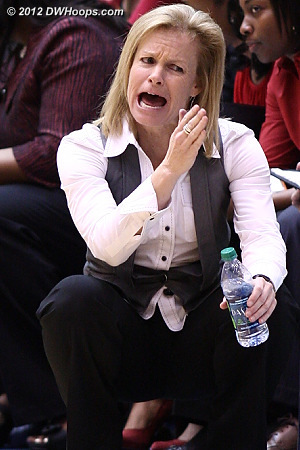 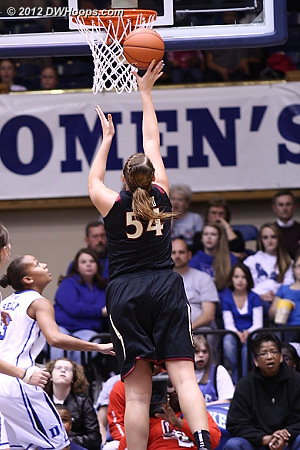 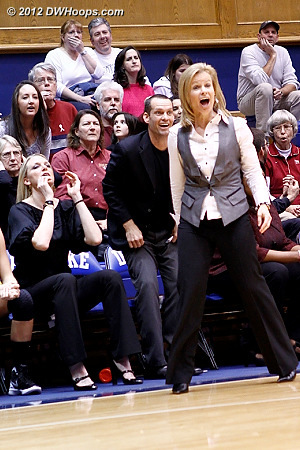 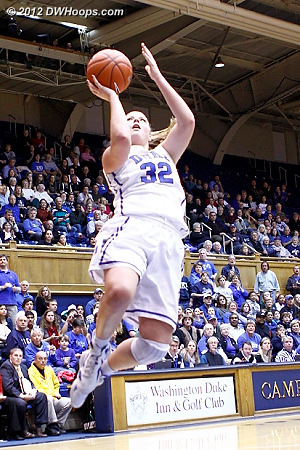 Tricia Liston, who led all scorers with 20, hits a first half buzzer beater. 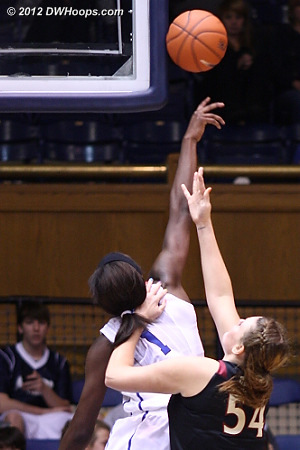 Bravard gets hoop and harm, fortunately for Duke the call was on Liston, not Williams' fourth. 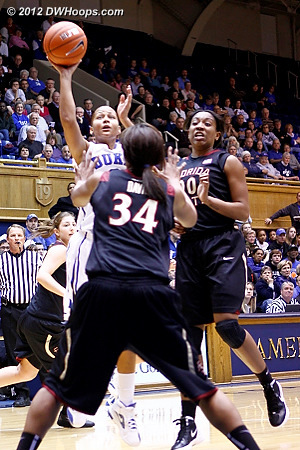 43-40 Devils with 16:21 left. 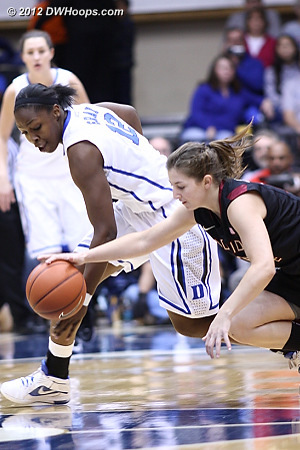 After a Haley Peters basket, Howard scored and was fouled by Chelsea Gray, 45-42 Duke with a free throw coming after the media time out. 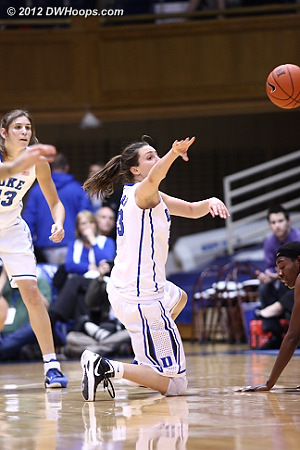 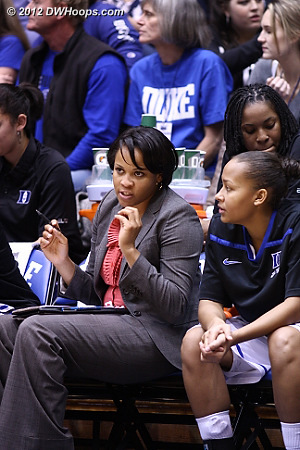 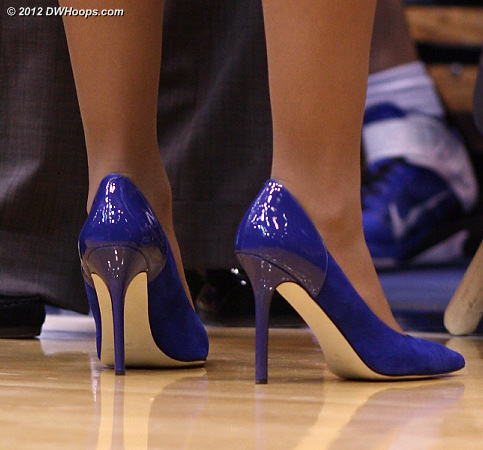 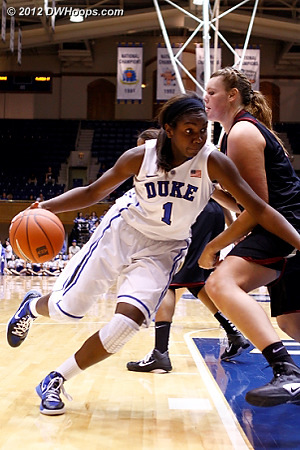 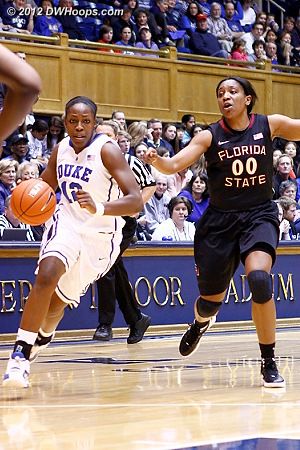 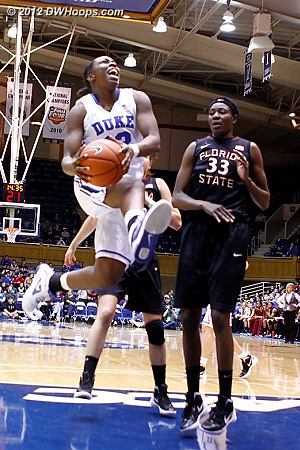 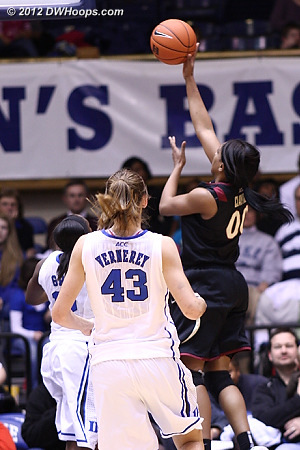 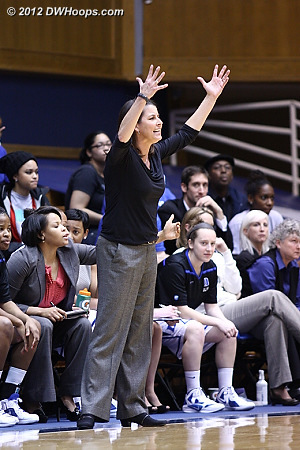 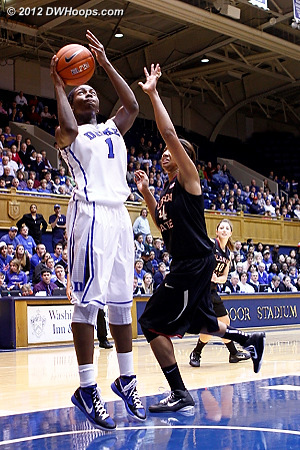 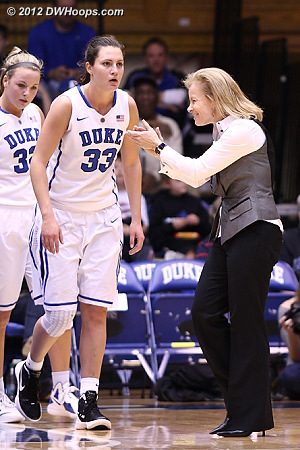 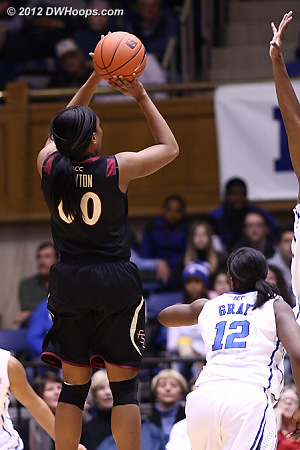 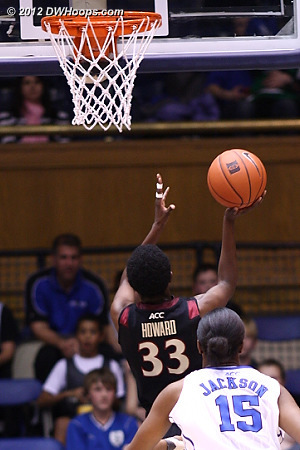 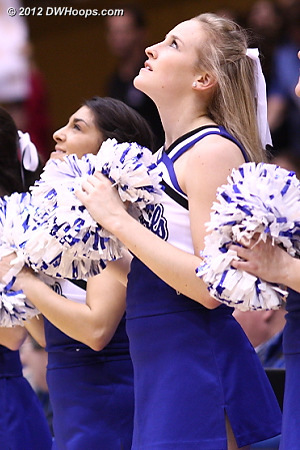 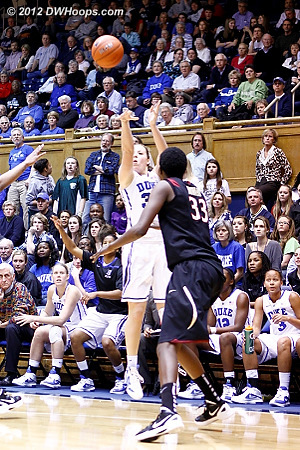 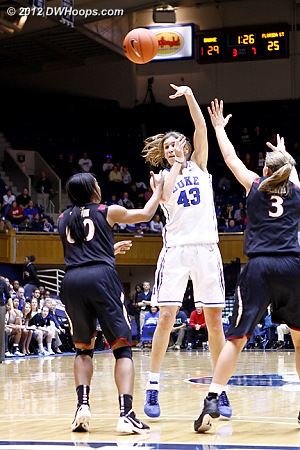 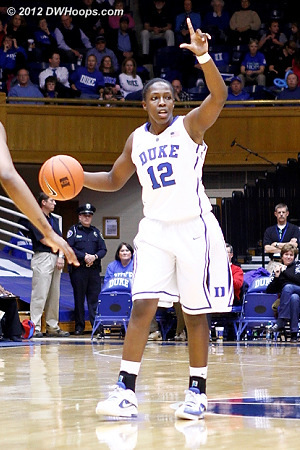 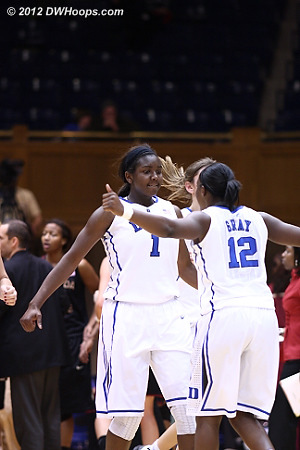 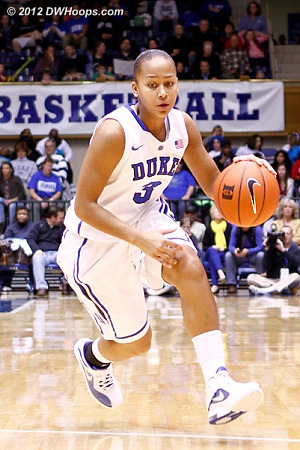 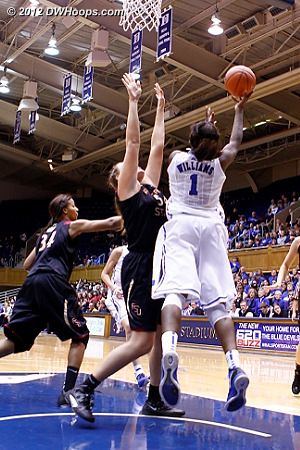 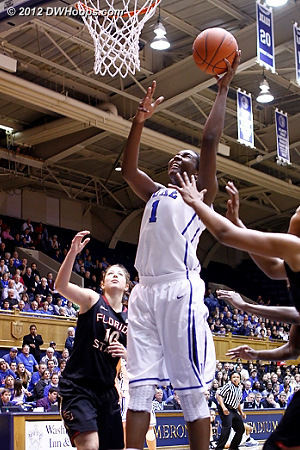 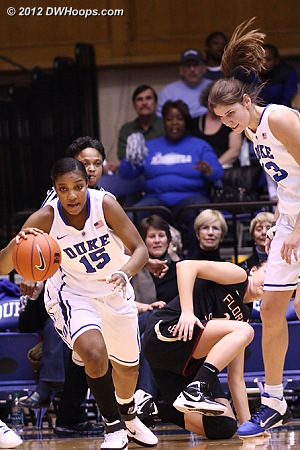 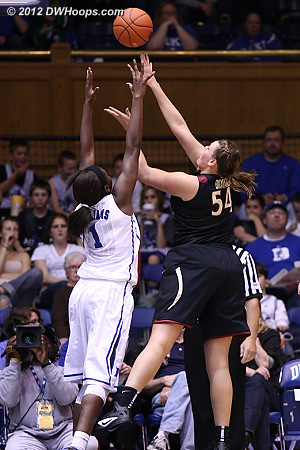 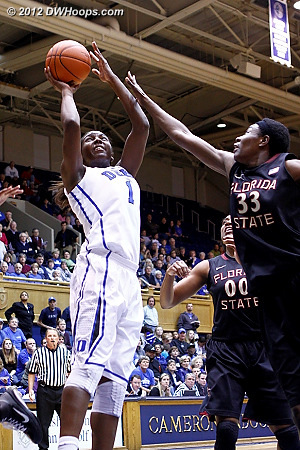 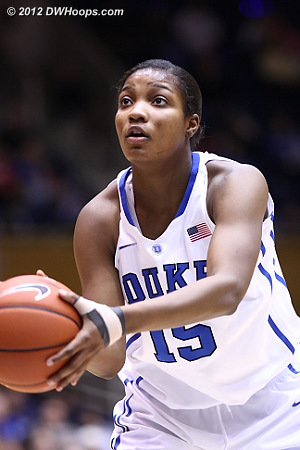 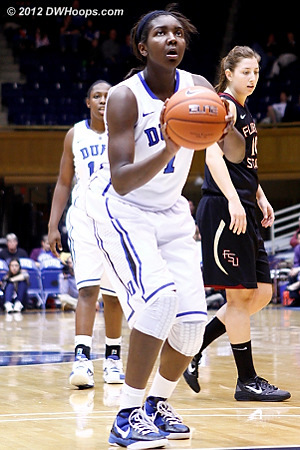 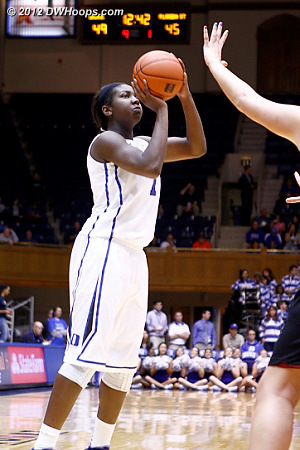 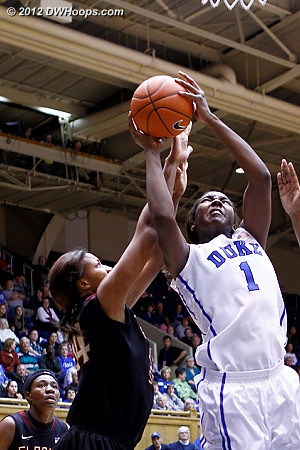 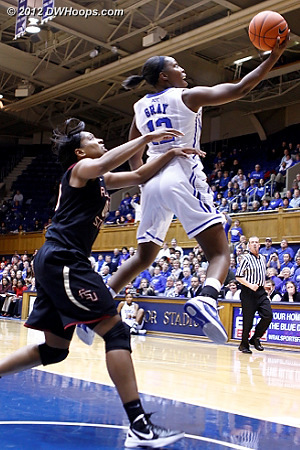 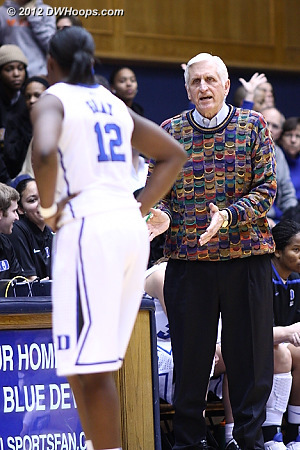 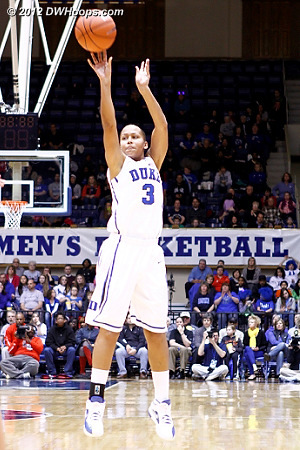 Richa Jackson converts a fast break layup from Haley Peters to put Duke up by six. 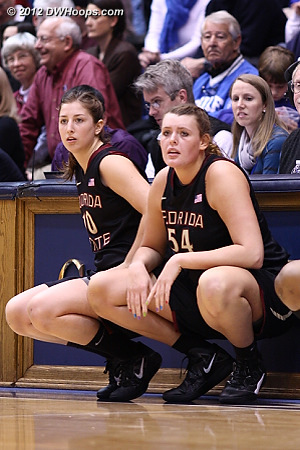 FSU gets a 30 second time out. 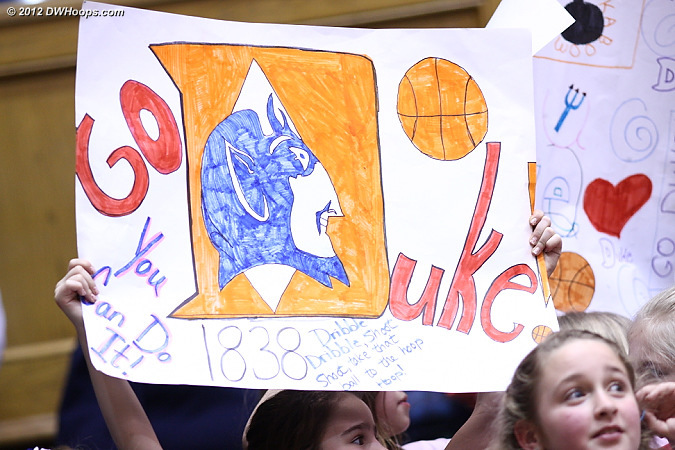 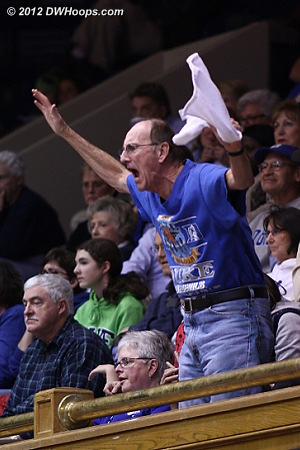 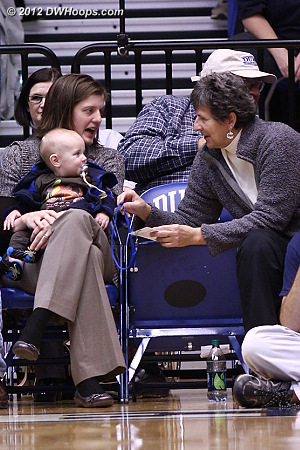 It's nice that most of Duke's home games aren't on weeknights, so that kids can come out and have some fun. 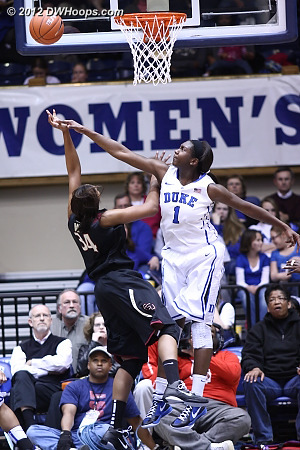 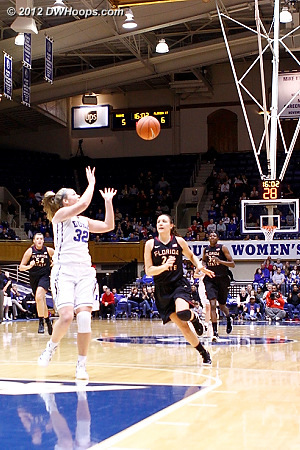 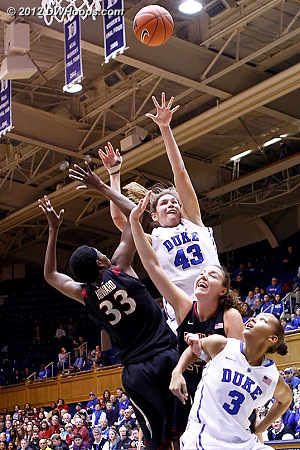 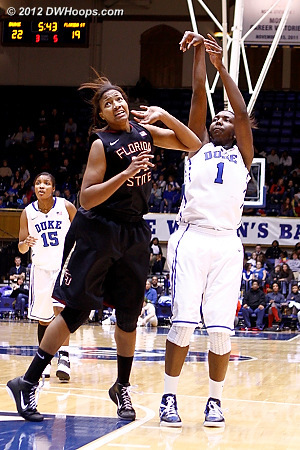 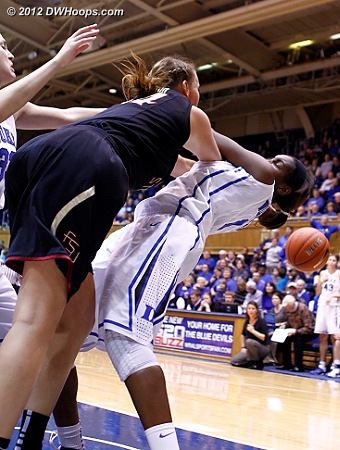 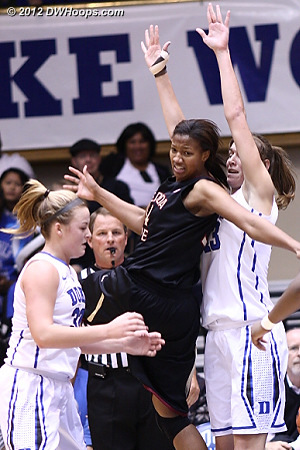 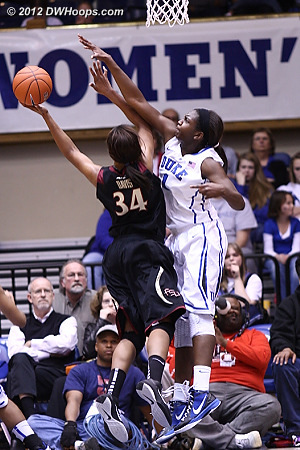 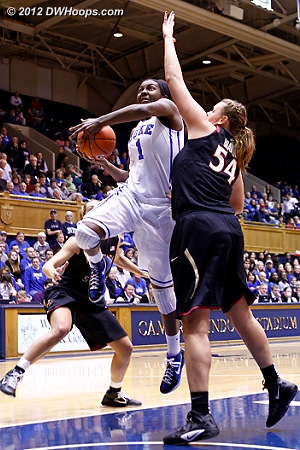 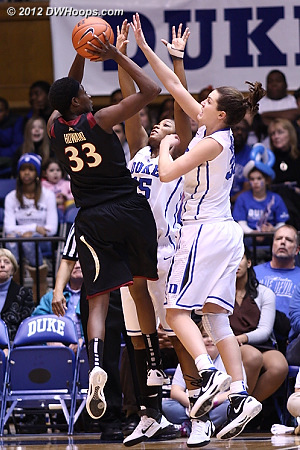 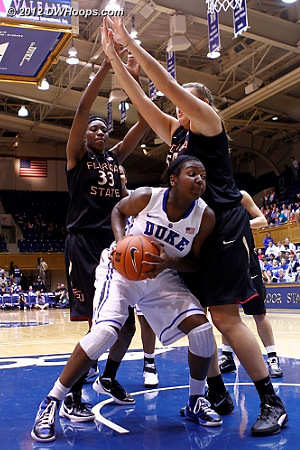 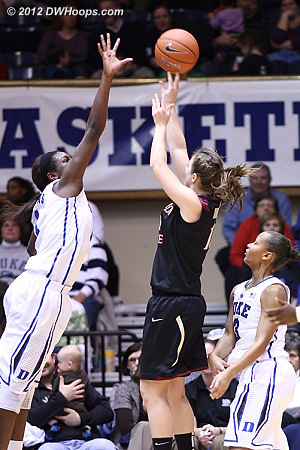 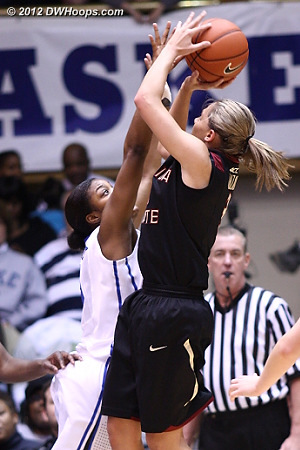 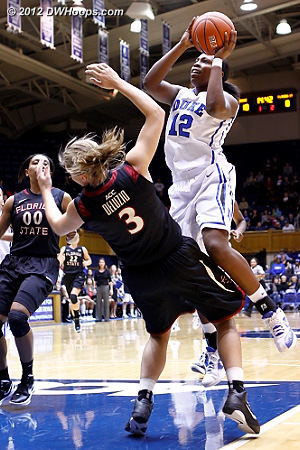 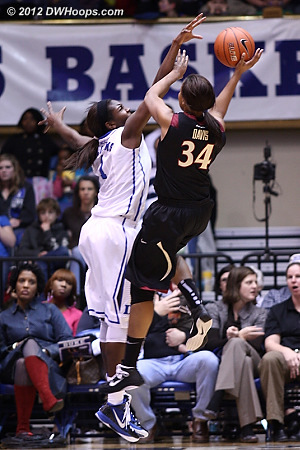 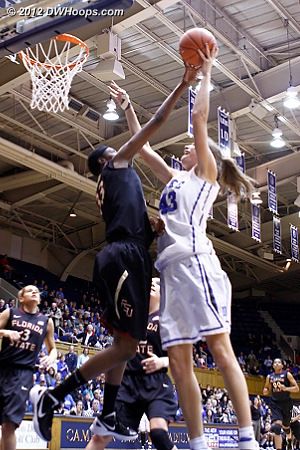 Allison Vernerey fends off Chelsea Davis while trying to put Duke up eight - it didn't go. 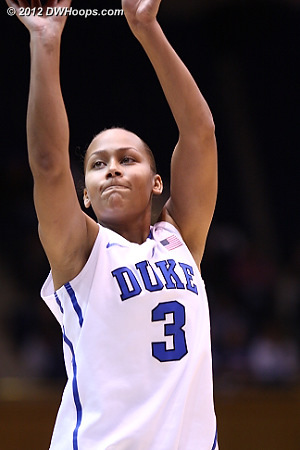 Finally a Duke trey falls, and the Blue Devils lead by nine. 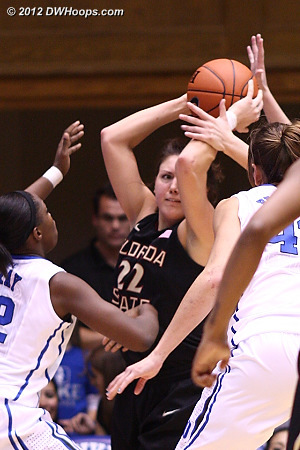 A wide open Leonor Rodriguez waits in the corner, but the Seminoles instead pound it inside to Bravard. 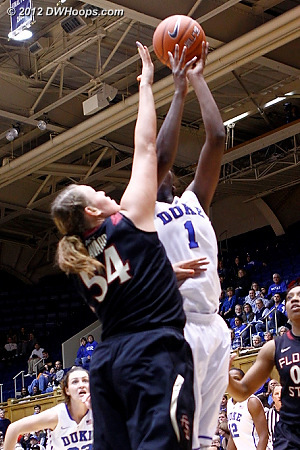 Elizabeth Williams swats Bravard's shot into the seats.